Winter in Chicago doesn’t typically spark excitement, but there is something magical and inviting about gathering around a wood stove for an evening of relaxation and warmth. Wood stoves offer a radiant heat that relaxes the body and eases the mind, and we can’t blame our customers for wanting the experience that a wood stove provides! As stove and heater aficionados, we know which stoves truly bring warmth and enjoyment, which is why we proudly sell and install Napoleon wood stoves. 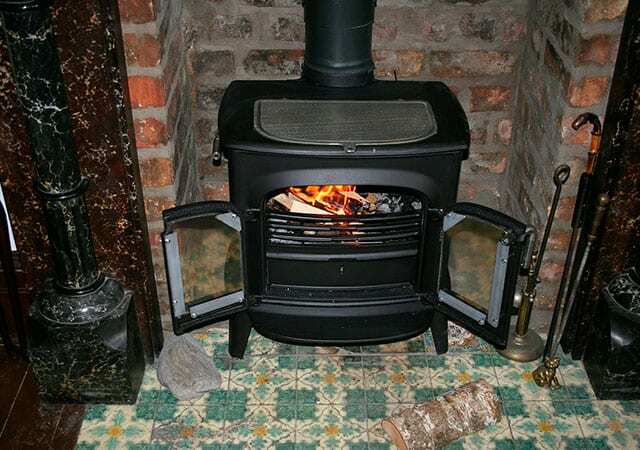 If you’ve been dreaming of a wood stove but are concerned with eco-friendliness, you need to see the many modern wood stove options available. Napoleon wood stoves are EPA-certified to burn cleaner and greener, so you can enjoy true warmth and enjoyment without guilt. Whether you’re looking for a simple, cast iron design or a gold-trimmed option with decorative and sturdy gold legs, Napoleon has it. These amazing stoves are highly efficient and well-crafted to last and provide years of enjoyment and comfort. Each stove carries the Napoleon President’s Limited Lifetime Warranty when professionally installed and maintained, so you know your investment is protected. Non-Catalytic wood stoves rely on tubes to send pre-heated air into the stoves to get the fire going. With a non-catalytic wood stove, you’ll enjoy large, mesmerizing flames, although you’ll burn through fuel faster than you would with a catalytic wood stove. Catalytic wood stoves rely on the use of a catalytic converter to reduce the temperature needed for the smoke to catch fire. Once the stove is up and running, temperatures swiftly rise and you’re provided with a great deal of warmth, without needing to constantly feed wood to your fire. These types of stoves are valued for their warmth and fuel efficiency, and for their reputation for reducing the amount of creosote produced during combustion. If you have any questions about the stoves we sell and install or need assistance deciding which unit is right for you, please give us a call at 847-893-0063. You can also reach out to us online or request an appointment online. Whatever you need, just let us know. We’re happy to help! Talk to us about the ease of installing a beautiful new gas fireplace insert to make your fireplace enjoyment more convenient than ever.